Reviews | Regal Ground Cayenne Pepper - 10 oz. Regal Ground Cayenne Pepper - 10 oz. I love adding a nice and spicy flavor to almost all of my meats. This is one of my most used spices in the kitchen. You won't find them cheaper than here ! Decent quality cayenne pepper, wish it could be a bit spicier. Definitely a decent purchase, however, I would scale up the amount of cayenne for recipes, though you should taste to test. As always, Regal spices deliver and at such a fantastic price. This cayenne is very good quality and arrived very fresh. I highly recommend this product. Regal Ground Cayenne Pepper is perfect for spicing up soups, stews and salads! Webstaurant, and the Regal brand has the best prices on spices, we couldn't be happier with the product! The Regal Ground Cayenne Pepper is fantastic. It's a fraction of the price at the local grocery store and the quality is just as good. I highly recommend buying this for your kitchen. My only regret, I should have bought the larger size! Powdered heat! Nice flavor, hint of smoke. Super value! 10 oz for the same price as 4 oz locally! I love adding this to many of our recipes! Love All my products from WebstaurantStore! The quality and price of the Regal Ground Cayenne Pepper in Bulk can not be beat! Spices are always fresh! Very Aromatic! Perfect amount of heat! Get ready for some heat! This ground cayenne is fresh, bright and packs some flavor. Often I find that you get mostly heat from ground cayenne but no flavor, this one doesn't disappoint. When cooking with it, it has the heat but not so overpowering that you can't enjoy it. This quantity of cayenne has lasted me ages and i can't be more pleased with it. I often use it to bring out just a little flavor which is why i prefer Regal to most other brands. Great balance! Great spice. We have been using this in our chili, enchilada sauce and taco meat and it's amazing. Strong flavor and a great price. Will order again. everyone in my family loves spicy food, this cayenne is probably spicier then any other pepper I have at home. I have chili powder, crushed red pepper, or you want a more fine textured pepper for your hollandaise, then I use cayenne. I have used some low quality cayenne pepper, and it makes a big difference. 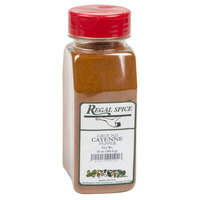 This is a great cayenne, I have used it on meats with rubs mostly and it is full-bodied without being chalky. Regal Ground Cayenne Pepper is a great product. You can not beat the quality , freshness and price of this product. Definitely will be reordering. I am very impressed with the quality of Regal Ground Cayenne Pepper ... The taste is much better than store bought. The color is beautiful ... Just the right amount of spice to perk up my meals ... so glad I found webstaurantstore.com. Im from Louisiana and we really live our spicy foods. I put Cayenne pepper on a lot of my food, especially my seafood dishes. Love it! Shop around, people. You can't beat the value of this spice. Now, will I use 10oz before it looses some of its magic? I don't know. But I am going to try! I will update if quality diminishes overly soon. I love cayenne pepper and this doesn't disappoint. It is not really hot. It's just hot and spicy enough to kick up a fuss in your mouth when you eat it on say, some spicy fried chicken??? Yum!!! The Regal Ground Cayenne Pepper is amazing. The heat you can add to a dish with this cayenne pepper is great . A little goes a long way. The price is great . We will be purchasing more of this in the near future. Regal spice is the best brand. I receive value for my money. The price is great and the package came on time and in great condition. Im adding more from Regal to my spice collection. This ground cayenne pepper adds a nice kick to our signature taco seasoning blend. Some heat with savory flavor. You can't beat the price! We add this to Cajun rubs for a tangy kick. The color is bright and vibrant. Love it! If you need to add some hot spice to your dish cayenne pepper will do the trick. This powder looks like paprika but is much hotter to taste. Be sure not to add too much as a little bit can go a long way. Regal Ground Cayenne Pepper - 10 oz. #10207113 This ground cayenne is what I would consider powdered. Upon contact with the tongue it is very spicy. It tastes slightly plain and maybe even a tad spicier compared to the cayenne I used to buy at other stores. For 10 oz and at this price to be sent to my home, I would buy this again. This Cayenne is perfect for that extra “kick” without adding much of an extra flavor. I wasn’t sure what to expect with this ten ounce Regal Ground Cayenne Pepper seasoning but I have to say it is quite delicious. I appreciate that the spiciness in subtly and there is not a yikes-this-is too-spicy moment. We used it for good old fashioned chicken wings and I would order again after only a few uses. This cayenne pepper has a much more intense flavor than the stuff we bought last time at another retailer. We loved it but will need to adapt our recipes accordingly. I love cayenne pepper. You don't need much and have to be careful not to overdo it as you can quickly ruin a dish, but in the right amount it's great. Love the Regal Brand of herbs and spices. You can't beat their quality and exceptional value. The Ground cayenne pepper has a wonderful bright red color, indicating it's freshness. Great kick, not too spicy. Just right! Good bulk spice, packs a good amount of heat. This goes in a lot of our soups and cafe items or when we have catering gigs. Packaging could use a revamp but overall the product is a good value for the price. Very, very fine grind on this cayenne pepper, which makes it a bit difficult to use in my opinion. Other than that it has a great taste and huge amount for the price. Use sparingly for a little heat or generously if you like to feel the burn. This is a large bottle so it will likely last a while and the best by date recommended using within about 2 years. Overall I consider this a good quality spice and I use it often when making hummus and as a general "pepper" when seasoning any dish. Great value in a large bulk size for multiple uses in the kitchen and beyond! Add an extra spice to your favorite recipes including hot sauces, tacos, and chicken. Decent ground cayenne with medium heat and body. This is a large amount for any kitchen that does not regularly use cayenne. I recommend this product. Love this size of the Regal gound cayenne pepper. It gives the perfect kick to certain dishes. Great flavor and it always arrives so fresh! Very flavorful, perfect size for our spice rack. Was expecting them to be a little larger, but the size met our needs in the end. Flavor packs the right amount of kick for recipes requiring it. These is a great value for the quantity and a good reusable container as well. The lid has two sides so you can dip a tiny spoon in or use the other side and sprinkle it. More of the same from Regal spices, they don't seem to disappoint at all. The price can't be beaten, the quality of the spices is as good as any other. I am just a big fan of all the regal seasoning. Great price, awesome product. I use this when I am making my BBQ rubs. Just adds a perfect amount of heat. This cayenne peper is a great addition to almost any dish...including chocolate. Good sturdy flavor...none of that cheap washed out taste. Great value for a strong and fresh product. Look no further if you need to add some heat to a recipe. This will do it without a problem, and without any off tastes. Use this in pretty much anything. I'm a stickler when it comes to spices but this cayenne pepper has a high enough quality for me. The price is also great. Not every spice from Regal is up to my quality level but this one makes the cut! Great product! Arrived exactly as described, with tape ontop to avoid opening while shipping. Will continue to order spices through Webstaurant - happy with price and selection. Plenty of heat from this staple item. I use this on everything from breakfast scramble to jambalaya. It is so versatile and a steal at this price. If you love heat in your food without being totallt overpowering than this is the spice for you! Add this to anything, eggs, ground beef even chicken! If your looking for a little heat and pepper flavor this Cayenne pepper from WEBstaurantStore is great nice kick but not overwhelming, super for Mexican dishes awesome price. This is my go to spice for adding the spice! it has a great clean flavor and adds a lot of heat for a little bit worth. Great in pretty much anything. Cayenne is one of my favorite spices to use when cooking. This bottle is a great price for the size, and gives great flavor to any dish you throw it in. Highly recommend. Cayenne is a must in most if not all my dishes. The taste and price are awesome and it gets the job done. This works better for me than fresh hot peppers where I may use too much and can't eat the food. This has a nice fragrance to it. It's not just heat. It actually has some flavor. I use it quite a bit in Tasso and other charcuterie applications at the shop. Regal Ground Cayenne Pepper is great, it comes fresh and I use it in many different ways. I use it in chili and my favorite hot cocoa. I love this 10oz of ground cayenne pepper spice! I use cayenne pepper in almost everything! This spice is pretty fresh and potent! You don't need much it goes a long way! This great cayenne pepper will give a nice little kick to your meals! Perfect texture and aroma make this product just great! I would recommend this product! This spice adds really good heat and flavor to dips, sauces, soups and main courses alike! A little goes a long way, so this container will last quite a while. Good product. Great value. Added the prefect amount of spice to our in house special recipe for our fried chicken breading. We Will buy again! Cayenne pepper is great to give a bit of a pick up to many dishes. It's just that litta extra something to go from mild to at least medium. A little dash goes a very long way. Good amount of cayenne for the money. The small size containers allow for ease of spice use, and is not over bearing to move around like the large containers. Fantastic nice and spicy ground Cayenne pepper taste good as Nd at a great price too thanks WEBstaurantStore I'll be ordering more spices soon !! This ground Cayenne pepper measures up in heat, texture, taste, and color with all of the other brands that I have had. Would recommend for sure. We started buying spices from webstaurant about a year ago and we've never had a bad batch. The small bottles are perfect to try them out or if you're tight on space. The price for the buck is very wonderful. If you often use this hot pepper, you may consider buying this large quantity. Or if you cook various dishes, you may want to "invest" in this bottle - it just lasts for a long time. The bottle is so well in sealing that the spice won't get old. I am so glad i bought this. We have tried several brands of Ground Cayenne Pepper. When we compared flavor and cost, Regal came out ahead every time. Highly recommend the Regal brand. This is the best pepper ever. Great value and exceptional taste. I use this in my lemonade cleanse and it has left me 12lbs lighter in 3 days. I love using Regal Spices Ground Cayenne Pepper in many of my chili recipes and other spicy dishes, to include pastas. This cayenne pepper always tastes fresh and makes a great addition to several other spices I use, to inlaid the Regal Crushed Red Pepper. I recommend this pepper to anyone looking for a fresh product to use in their kitchen! I think every kitchen needs cayenne in some form. It's perfect for giving something a little kick. As with all Regal spices, this stuff is cheap and tastes great. This pepper was another good product sold by the Webstaurant store i Used it for the preparation of my buffalo wing my family really enjoyed them and my husband said that the pepper really packed a punch. The cayenne pepper is a vibrant color and flavor. I use it in many favorite dishes such as tacos, nachos, chili, and stir fry dishes. This an excellent quality spice that I use daily in my spice rubs and seasoning foods. It fits great in a container with all the other spices for convenient storage. I am a big fan of cayenne pepper but it can get quite pricey at nearby grocery stores. Whenever I order things from Webstraurant, I tend to get various spices as well. Good quality, great price! Love this product. It has the heat I desire. Great quality. It has won me over. Thank you for the excellent price and quality. I will definitely recommend to friends and family. This cayenne was a great addition to our rub. It added a good amount of spiciness. Was also a competitive price. I will be purchasing this again for my future cooking needs. The texture and taste of this Regal Brand Cayenne Pepper are amazing! We use this in quite a few recipes to add some spice in them! The Regal Ground Cayenne Pepper is the best quality and flavor I have found. It adds so much zing to your meats dishes and sauces. Regal spices are always fresh & great taste, nice container size for kitchens with limited shelf space. Thanks to Websaturant for the affordable prices & shipping. I really like the flavor of this cayenne. It has enough heat to add punch to recipes, which seems sometimes to be a problem with other brands. The lid options of sprinkle or spoon are very convenient. Just don’t confuse the two! HOT and fresh! the best way to describe this one. 10oz is the perfect size not to lose freshness in our kitchen. We make a lot of rubs so this goes a long ways! Everyone needs a little spice in their life so why not do it with cayenne pepper. I use this in all my BBQ rubs and it's great. It has great texture and heat that you just can't beat anywhere else. The cayenne pepper tastes like it should, and there's not much more to comment on here. Bought a smaller container to give it a try, but after seeing the spice is of good quality, I'll soon be ordering an extra 5 lbs. I add cayenne pepper to my dishes when I'm searching for that extra kick. However, sometimes it can get way to spicy. This has a great spice balance that delivers the perfect heat. Good cayenne pepper at a nice price. You won't run out too soon, and the quality is great. We have been pleased with all the Regal spices. The texture and consistency of the cayenne pepper is just what you would expect! Great flavoring and quality. We use it in a number of our recipes. Price is consistent with large box retailers, but it's nice to have it available in bulk. Another loved spice in our household. Used on many of our dishes and in many sauces and stews. Over half way gone and will be replaced soon. The Regal line of spices are a great value. You get a lot of product for the money. I use cayenne pepper to kick up a lot of my Mexican, southern, or BBQ dishes. It works great in rubs for smoked meats. This will last a LONG time! Like many other products, Webstaurant Store has the best prices. Quality has been great - I try to get as many of my spices from here as I possibly can. This cayenne pepper is a great way to spice up Mexican dishes and also a nice way to give your guacamole some kick. Added some to fresh guacamole, everyone loved it. Good flavor and great price. This ground cayenne pepper is great! It's super spicy and packs quite the punch. It goes great in chili sauces and salsas. Also great for making a spicy fish taco rub. Regal makes a wonderful tasting Cayenne powder. This is a great size and very economical. Compare it to the famous spice maker and you can really see the savings without taste compromise. Even though Cheyenne pepper is best used in sparing amounts, we still go through quite a bit. Our foods aren't hot but we put it into many different items and since those items sell so quickly we usually make quite a bit. We have been using Webstaurant's Cheyenne pepper for a while and it has never disappointed us. This is a great seasoning to have around. We add it to our sauces and marinades. The texture and flavoring of the pepper is perfect. Regal brand is economical without giving up quality. This Fine Ground Cayenne Pepper is wonderful!!! Good for making spicy sausage and peppers or for adding a hint of red to your favorite cream sauce!!! This is a fine bottle of Cayenne pepper. Just sprinkle tiny amount of the powder into most dishes and it just adds that extra kick to them. Good deal.